In 2011, nearly 2000 teen drivers ages 15 years old to 20 years old were killed in motor vehicle crashes. Eye-opening statistics like this have prompted many states, including Maryland, to introduce a Graduated Driver Licensing (GDL) program. The first step in the Maryland GDL is to get your learner's permit. 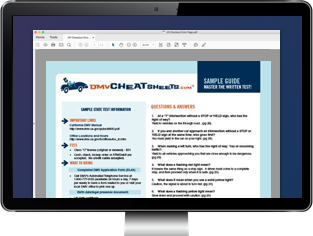 Below, you'll learn everything you need to know; from what documents to bring to the Maryland Motor Vehicle Administration (MVA), to how an online practice test will help you pass your written exam on your first attempt. If you are new to Maryland and have a learner's permit from another state, it cannot be transferred to a Maryland learner's permit. You must complete all of the requirements of the graduated licensing system, including the completion of a certified driver education program and logging the designated number of behind-the-wheel driving hours mentioned below. This type of permit is for those who have never had any type of driver's license. For the most part, this page is dedicated to Type 1 learner's permits because it applies to the majority of first-time drivers. Age: 16 years and 6 months old. Duration: Valid for 6 months. Possession: Must be held for a minimum of 14 days prior to taking your skills test. For more information about a Type 2 learner's permit, please contact the MVA at (410) 768-7000. 6 hours of behind-the-wheel instruction and training. NOTE: You'll need to obtain your learner's permit before beginning the driving component of your driver's education course. Once you successfully complete your course, your course provider will notify the MVA electronically. Now it's time to head to the MVA to take your written permit test. You must be at least 15 years and 9 months old to apply. A learner's permit application (available at the MVA office). Proof of age and identity (e.g. valid unexpired U.S. passport, valid unexpired Permanent Resident Card, unexpired employment authorization document). Proof of your Social Security number, OR proof of ineligibility (e.g. original Social Security card, W-2 form not more than 18 months old, pay stub with your name and SSN not more than 3 months old). Proof of lawful presence in the U.S. (e.g. valid U.S. passport, Consular Report of Birth Abroad, employment authorization document). 2 documents proving Maryland residency (e.g. utility bill, checking or savings account statement, cancelled check with imprinted name and address). If you're under 16 years old, you must also provide a completed Learner's Permit School Attendance Certification Form (Form DL-300) to an MVA official during the learner's permit application process. This form must be handed to the MVA in the sealed envelope provided by your school or county Home School coordinator, if you were home schooled. For more information about the documents listed above, please refer to this list of Sources of Proof . Your written MD learner's permit test will be computer-based and administered at your local MVA office. The written exam is based on information about Maryland traffic laws, road signs, and safe driving techniques discussed in the Maryland Driver’s Manual. There will be 25 questions on the exam, and you must answer 85% of these questions correctly to pass. In addition to taking and passing the exam, you will also be required to pass a vision test and pay the $50 fee. The learner's permit will be valid for 2 years from the day it was issued. To help you prepare for your written exam, the MVA offers a basic practice test. In addition, we recommend preparing with an online practice test from our approved partner. Log 60 hours of supervised driving time. 10 hours of supervised driving time must be at night. Record your hours on a Practice and Skills Log by your qualified supervising driver. A qualified supervising driver is a parent, guardian, or mentor who is 21 years old or older who has held a valid license for at least 3 years. This behind-the-wheel driver training is in addition to the 6 hours of driver training you completed during your Driver's Ed course. As mentioned above, whenever you are behind the wheel, you must always have your learner's permit in your possession and be accompanied by a licensed driver 21 years old or older who has held a valid license for at least 3 years. You may not use a wireless communication device (e.g. cell phone) at any time while driving with your permit, or you face the suspension of your driving privileges. In the event that you should need a replacement learner's permit you'll need to appear at the MVA in person and bring the documents mentioned above. The fee to replace your permit is $20. For more information, please refer to our Replacing a Lost License page. Once you have your learner's permit for a minimum of 9 months, you're ready to continue your quest to get your Maryland driver's license. The next step in the GDL process is to get your provisional driver's license. For more information, please refer to our Maryland Teen Driver's License page. Now that you have the freedom to experience driving, we urge you to be safe and responsible. Together, we can make our roads a safer place to travel.